A ground beef patty spiced up with corn and taco cream cheese stuffed inside, then topped with pico de gallo, Muenster cheese, avocado, jalapeno and taco mayonnaise. Whisk together all ingredients until smooth. Reserve refrigerated. Combine all ingredients. Reserve refrigerated. 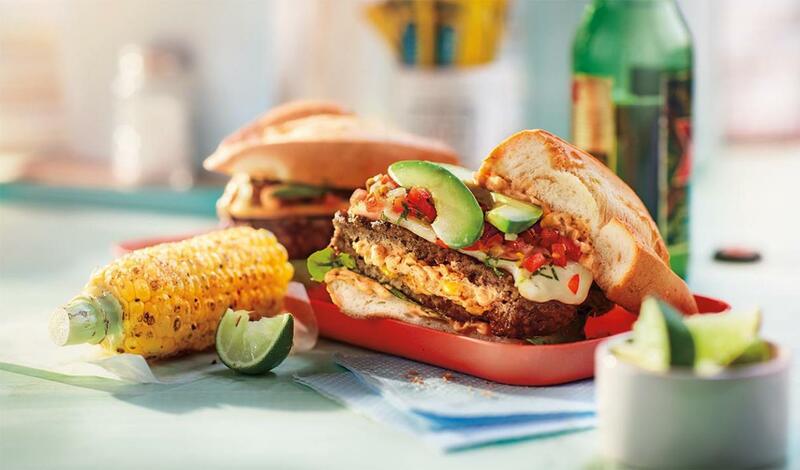 Create a stuffed patty by sealing 6 oz ground beef around 2 Tbsp Taco Cream Cheese. Grill until cooked through. Top with a slice of Muenster cheese. Spread Taco Mayonnaise on both sides of the bun.